Original article posted by TV Time's Georgina Shirk. The analysis to follow is our own and does not necessarily reflect the views of TV Time. 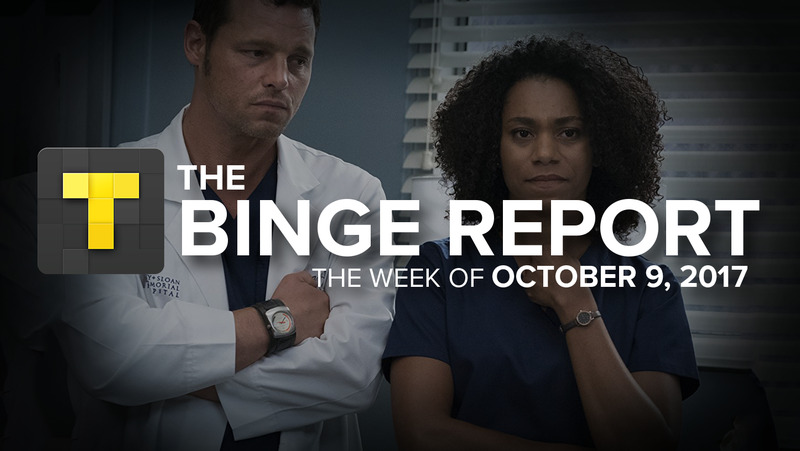 While Grey's Anatomy remained the #1 show on this week's Binge Report, the biggest story is Riverdale's entry at #2. The average viewer watched 1.26 episodes, which is a huge accomplishment given there's only one episode in the second season so far. The season premiere had a huge ratings spike due to people catching up over the summer, mostly on Netflix. This shows that there was still plenty of delayed viewing. Also new on the list for The CW was The Flash (#5) and Arrow (#9). These placements make sense given The Flash is overall a more popular show than Arrow; however, Arrow had more episode streams per viewer. Both show that The CW has a sizable audience outside of the Live + Same Day ratings. Fantasy drama Once Upon a Time also entered at #8, giving ABC its third show on the Binge Report. 2.20 episodes per viewer demonstrates the fact that people are still catching up from the season premiere a couple weeks ago. It also shows that there are plenty of viewers who are responding well to the retooling of the show. Riverdale's #2 entry bumped The Big Bang Theory (#3), How to Get Away with Murder (#4), and Lucifer (#6) all down one spot. but all three still have impressive number of episodes per viewer being watched. It appears that they're here to stay. On the cable side of things was American Horror Story, steady at #7, and Game of Thrones, which tumbled four spots to #10. Still, the fact that it's even on the list so long after its season finale is very impressive. What's even more impressive is the 4.32 episodes per viewer statistic. Those who are watching the show are watching a lot of episodes, not just one or two. *The weekly Binge Report tracks and ranks shows based on the number of episodes consumed by the millions of fans across the globe in our TV Time app.